So at this point, your kids (or yourself) are likely back off to some sort of educational institution – if indeed you’re ‘school aged’. And now that we’re a couple of weeks into the school year, I’m guessing you’ve also discovered what teachers are awesome and which ones will put you to sleep, what boy or girl to have a crush on in class, and what school supplies you are missing. Put a smile on your loved ones’ face: pick up a school-appropriate gift to show off a couple of weeks into class or to make their lives a little easier. Case in point? Today’s featured items! Looking for a durable, well-designed lunch bag? Trust the school supply experts at Dudley to have you covered. This brand has been around for nearly a century, and while they’re best known for their combination locks and locker accessories, their lineup of school supplies is growing every year. One of their newest innovations is the Fully Loaded Lunch; a smart bag that can rest flat or standing up, without risk of your lunch getting super jumbled. It’s also got two extra pouches on the front so you can keep things separate and right at your kids’ fingertips. When I was growing up, so-called erasable pens were basically just a way to quickly and effectively destroy your looseleaf or notebooks by essentially burning a hole in the paper. It took a few years, but Pilot has perfected the erasable pen – I use these at work and my coworkers and I are OBSESSED. Thus I am sharing them with you. They come in amazing vibrant shades as well as classic blue and black, and work fantastically in terms of both their writing capabilities and more importantly, their erasing. Seriously, you will find yourself jotting incorrect things down just for the novelty of erasing them. I promise. 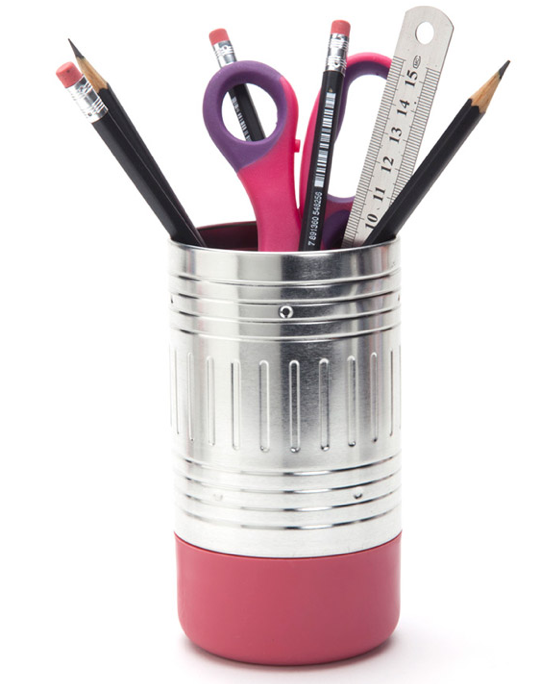 Not only does this retro-inspired pencil cup look like the original ‘stylus’, it also serves multiple purposes. Stash your pens, pencils, paintbrushes and other long and skinny items on your desk, but take note: the ‘eraser’ bottom portion also detaches and functions as an extra storage space. Keep love notes, a spare key, or bits and bobs that are best suited to an easy-to-rummage-through bin (like tacks or paper clips). An awesome pick for that irony-seeking college student. I’ve been seen Quirky products all over the place in stores now, which is pretty cool because I’ve been featuring them for years. Anyway to give you the 5-second spiel: Quirky is a social product development portal, that uses influencers and innovators to determine what to produce and how to make it the best product possible. They’ve taken a crack at reinventing the stapler with Align, a unique stapler with a detachable base so you can staple anything, in any direction, include awkward center angles that regular staplers can’t hit. 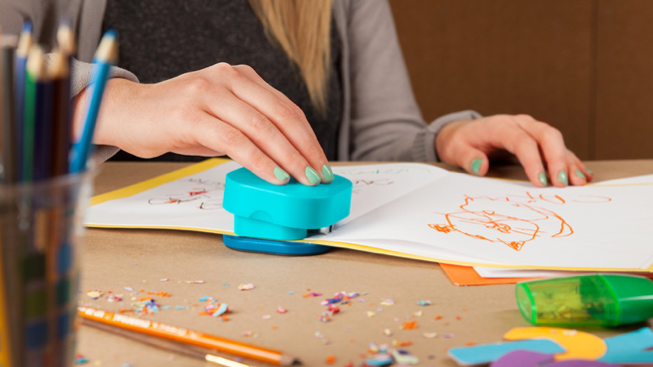 It’s particularly useful if you’ve got a little one that’s in touch with their artistic side; suddenly stapling together a book or a border for their precious crayon picture isn’t so difficult. 1) Leave a comment below by September 30, 2014 telling me which of today’s featured back-to-school gifts you’d love to buy and why! 2) Entries are limited to one per person / per email address / per household (or more if you score bonus entries). A random draw will be conducted on or around October 1, 2014 to select the winner(s), who will have 48 hours to respond before another winner is chosen in their place. 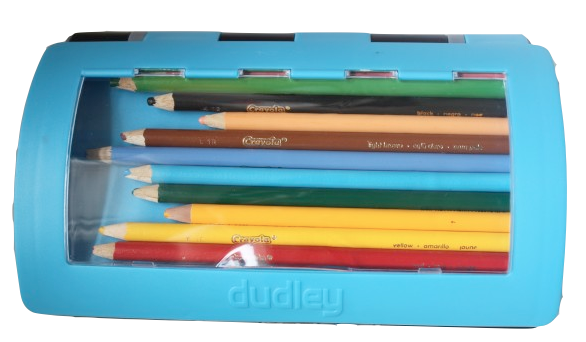 4) Bonus Entry: Like Dudley Canada on Facebook and leave a comment speaking to one of their products. Link back to your post by leaving a separate comment below to earn yourself an extra entry into the draw. I don’t have a young one at school right now, but my daughter would love the Pencil End Cup for her desk at home. She likes to keep things organized and loves quirky things. i have a toddler who just started school and yes anything erasable for her please. I’d love the erasable pens. I love color & do crosswords all the time. Being erasable they’d be perfect for that. I’d love to buy this for myself and possibly share with my boy: Pilot FriXion Clicker Retractable Erasable Gel Pens, Fine Point, Assorted Colors. I have a pen obsession and erasable – o yeah! Perfect for school as well. Thanks for the chance to win the lunch bag and pencil pod! The Align stapler would be very useful! I would love to buy the Align Stapler as my granddaughter loves to do crafting and a regular stapler just is unable to staple where she wants it quite often. The Pilot FriXion Clicker Retractable Erasable Gel Pens.. I make mistakes and to be able to erase a gel pen, that would be awesome. I have to pick the Align Stapler as I have had to put books together at school too many times! I’d be most interested in the Pencil End Cup for my grandkids. They are constantly looking for pens and pencils and can’t seem to keep track of them. 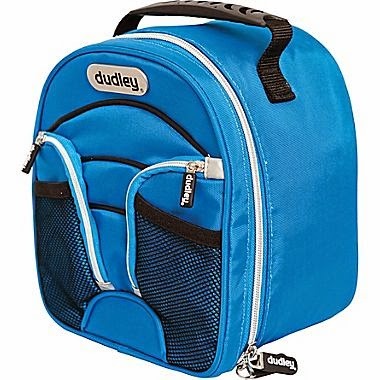 I’d purchase Dudley the Fully Loaded Lunch bag. My son always somehow ends up destroying his! This bag looks super durable and very fashionable. For the New Schooler: Zoo Backpacks – $24.95 each @ Indigo ! the hippo is the cutest! I like the zoo backpacks – the Monkey and the Hippo would be perfect for my granddaughters. The fully-loaded lunch bag is perfect – for adults or for kids! I would buy the lunch box. I would love to get a zoo backpack because I think my niece would love it! The Fully Loaded Lunch Bag: I love the two extra pouches on the front – I would use them for milk tickets and lovie dovie gaggy notes! I want the pencil pod! It looks really cool! I’d be most likely to buy the Align Stapler – there are ALWAYS awkward things that need to be stapled in my life and it is such a struggle…! My son just started pre school and would love the zoo packpacks! I’d get the Quirky Align stapler for myself. I’ve gotten into crafting in the last few months and there’s only so much you can do with sticky tape. I’m no longer school aged, but always love back to school sales. I’m a stationery nerd. I would like the Dudley The Fully Loaded Lunch for my son. Have to pack his lunch everyday and this seems like a good sized bag. Love the Zoo backpacks. I know 2 preschoolers who would love these. I’d love to buy the erasable pens as I have always through they were handy and clever. love the Align stapler — the answer to my childhood dilemma — how to make books and staple them together . so great! I’d love one of the zoo backpacks to give to my nephew who is starting kindergarten. Retractable gel pens because I LIKE THE COLORS OF INK AN THINK THE ERASABLE QUALITY IS GREAT! I love the Little Zoo backpacks and I know my grandson would love the little monkey one! I know my niece would love one of the zoo backpacks. My grandson would love one of the Zoo backpacks because he loves all animals. I think the align stapler looks very cool!! 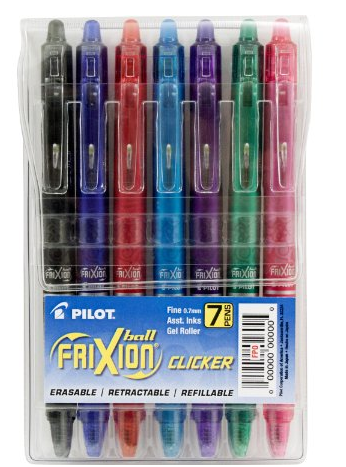 i would like the Pilot FriXion Clicker Retractable Erasable Gel Pens…i’ve used their products before and they work great. The zoo backpacks are really cute. I would LOVE to buy those gel pens – how cool are those? Thanks for the contest ! I would have to pick the Align Stapler. I have had to put books together and this would be perfect.